William Hope Hodgson (1877-1918) wrote many classic of supernatural horror including THE HOUSE ON THE BORDERLAND, THE NIGHT LAND, "The Voice in the Night", "From the Tideless Sea" as well as creating CARNACKI, THE GHOST-FINDER. 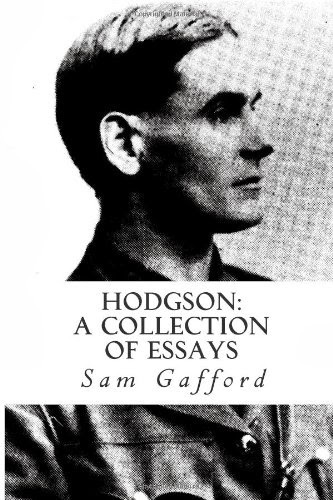 Since 1992, Sam Gafford has been at the fore-front of Hodgson criticism and scholarship. This book combines several of his most important essays along with newer articles about Hodgson's life and work. Included here is the ground-breaking essay, "Writing Backwards: The Novels of William Hope Hodgson" that led to a completely new evaluation of Hodgson's novels with the revolutionary claim that THE NIGHT LAND was actually the FIRST novel that Hodgson ever wrote! An in-depth investigation of Hodgson's infamous with Harry Houdini in 1902 is the subject of "Houdini v Hodgson: The Blackburn Challenge". This collection provides a foundation for further criticism and study of Hodgson's life and career. Purchase Hodgson: A Collection of Essays by Sam Gafford on Amazon.